“What has been will be again, what has been done will be done again; there is nothing new under the sun” (Ecclesiastes 1:9). The years 1095 – 1230 AD have rightly been attributed as the darkest chapters in the history of Christianity. And skeptics today still cite them as their most frequent objections to the Christian faith. And looking at them historically, I would say they have a point to some degree. From 200 to 900 AD, Christians primarily inhabited the lands of Israel, Jordan, Egypt, Syria and Turkey. However, when Islam came upon the scene around 500 AD, it spread, through violence, to the point that they invaded these lands and brutally oppressed, enslaved, deported and even murdered Christians living in those lands. Islam eventually took over the Holy Land and her most sacred places. And the response of the Western Church who “claimed” the name of Christ was to fight. To fight and win. Sword with sword. Violence with violence. And take back what is rightfully theirs by the Divine Writ of Jesus (so they reasoned), His Holy Land. We have to repel them back by force, murder and bloodshed just like they did. Well, my friends, that happened in the name of Christ, but it didn’t make them Christians. As a matter of fact, that type of behavior during the Crusades in the Middle Ages goes directly against the message of Christ and His Gospel. Just ask Peter in the Garden of Gethesemane. In fact, I would argue that the Name of Christ was abused, misused and blasphemed by the actions of many of the crusaders during that dark period of our history. But the point is well taken nonetheless. But in 1979 the Islamic Revolution came to full fruition in terms of the war within their own ranks as to which form of Islam was going to be the most culturally dominant, even if it isn’t the most popular. And the most culturally dominant and aggressive form where Sharia Law is invoked won out. They argued that their form of Islam has direct roots to the Prophet Muhammed’s life style himself. “He died in Jihad. Therefore so should we.” And “they” would be right. We didn’t care about this in the United States (still don’t). That is until Jimmy Carter was too soft and misunderstood the significance of 1979 because it signaled to anyone paying attention that the new Islamic jihad was going to be directed not inwards anymore, but outwards towards us (Europe and The United States). He learned really fast during the hostage crisis he was wrong. The Islamic war against the West has been growing and growing and growing and growing and building and building ever since. And it will not stop. And that’s because it aims to conquer. Period. And the reasons for this are simple: they want revenge from the crusades that took place in the Middle Ages because they have roots in a part of the world where history never dies. They also want total control of the West and will stop at nothing to evoke Sharia Law in the places they conquer through repopulating the area with people who think like them and then hold others who don’t hostage, by force if necessary (research Deerborn, Michigan if you don’t believe me). Hubris – We are prideful about our way of life and think nothing can harm us. Nothing can conquer the Western Spirit, either in Europe or in the United States. Uhm…say hello Roman Empire. Again, there is nothing new under the sun. From Within – You can’t attack the United States head on. You have to destroy them from within. The answer? Birthrates. In the Paris attacks yesterday, one pro-ISIS individual professed to having 34 children. I have two. The birthrates in this militant Islamic climate is staggering in comparison to those who are reading this. Imams in major metropolitan areas of the United States who have views similar to Ayatollah Khomeini have encouraged this for a reason. You establish a majority from within and then commit jihad. Ah, Derrick that’s hogwash. Really, my friend? Did you watch the news yesterday about what happened in Paris? Do you think they just hopped on a plane and did that? No. It was an inside job. A battle has been brewing in Paris for a while now over Sharia law. Why do you think that is? Wake up. It’s gonna happen here. It’s a matter of certainty, not possibility. They See Our Ideas About Tolerance, Love, Openness and Kindness as Weak Character Traits, Not Strong Ones. – I have these character traits and I’m proud to have them. That’s the kind of person God created me to be. And I’d rather be naïve with these traits than to be the exact opposite and without mercy. This type of radical Islam that you are seeing exploits people who are like me and probably like you. Well ISIS and folks repopulating major urban areas in our country RIGHT NOW use forgiveness, mercy and kindness and love to their own advantage because they see it as weakness and an opportunity to take advantage of people for their own benefit. That’s called having evil motives to begin with. We make mistakes and ask for forgiveness because we want our hearts to be pure before the God of the Bible. But this type of extremism you are seeing in Paris – they believe – will usher in the End of Days in their world view. That’s why it is encouraged. And the more infidels they kill the greater the reward in heaven. So my friends, be as gentle as doves but as wise as a serpents. Your graciousness can and will be used against you in the years ahead. But don’t change. Be wise and think instead of letting the media do your thinking for you. The Media Encourages Us To Think of Islam as a Tolerant Religion When The Very Roots of It Are Born In Violence and Murder – That’s how it began. It’s not how the Old Testament began in the first two chapters. And what flows in chapter 3 of Genesis sets the stage for all of humanity, not just Jews, Christians or Muslims. Quite the opposite with regard to Islam to begin with. It began with violence and conquered through force. That’s a fact from history. It spread by force from Mohammad himself. That’s the exact opposite of Jesus’ message, which was spread through love at the expense of oneself. Now listen carefully. Not all Muslims are the same. Not even close. Some are more gracious than Christians. My next-door neighbor is Muslim and he’s one of my best friends. I love talking to him because we are worldviews apart, which is very beneficial for both of us. But I asked him about ISIS and Paris and Bin Laden and these radical cells and his response was “I left Afghanistan because of this extreme radicalization that aims to conquer. It’s here now and I’m worried about it.” It’s one thing for a white redneck Southern preacher to talk about being worried. But quite another for an honorable Muslim from Afghanistan who thinks the exact same way about what is going on. That tells you all you need to know. The Presidential Administration is Pro-Islam not necessarily in word, but deed - Nothing wrong with encouraging diversity. I like diverse religious opinions. It helps me think through things. But the problem is the extreme ISIS type folks who are having 634 children to my 2 are using this “tolerant” idea and mass-producing preparing for Jihad…all under the rubber stamp of this Presidential Administration. And make no mistake, this is an administration that at the same time discourages Judeo-Christian principles. This is indeed a religious issue that will result in problems down the road. Don’t be confused by the word “secularism” by the talking heads in the media. You don’t encourage one religion in the public sphere and discourage another in the name of secularism. Pray – of course – but that’s not enough. Develop a Gospel Centered Apologetic – An “apologetic” doesn’t mean you are apologizing for being a Christian. It means, “to defend the faith.” And to defend the faith in our pluralistic culture you not only need to know why you believe what you believe about your faith. You also need to be familiar with Islam and its historical roots. 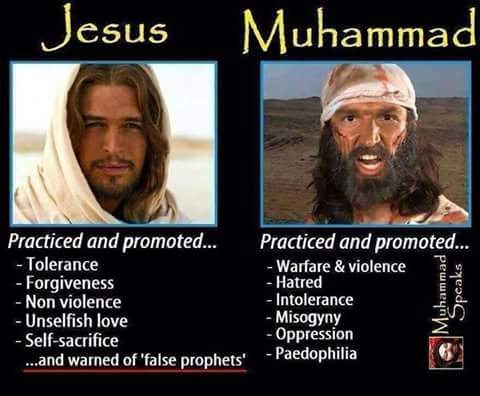 You need to do some studying on the prophet Mohammad and Jesus and compare and contrast the two religious figures. Their messages are radically different. Avoid Mudslinging – When you sling mud on others not only do you get your hands dirty, you also lose a lot of ground. Love the people you encounter who believe that all religions are equally truthful and say essentially the same thing but are wrong in their thinking. You need to be able to explain the differences and why this is important for them in terms of having a relationship with God. This issue will come to the forefront with Islam spreading. You will be in the minority as a believer in Christ in the next twenty years and need to know why you believe in Jesus that goes beyond your upbringing or church attendance. Turn Your Sword Into Plowshares – Unlike Peter, we don’t fight violence with violence. We fight it through faith and the truth of the Gospel. Be practical as well and recognize that this issue is bigger than your own personal comfort in life and will continue to be – Above all I am someone who will give his life to defend and protect the people I love with all my heart. To watch them have the prospect of prospering, growing and being safe and happy under my guard makes me happy to think about. Life is at stake. Liberty is at stake. And so is our way of life. And when you stand up for Jesus and address these issues without fear, you are equally defending and protecting the defenseless so they can prosper. And to do that we need to be courageous as believers in this Brave New World, particularly Christian leaders. And I fully intend on being a soldier of the Lord and dealing from a religious perspective with what is doing on in the public sphere, most especially in Vero Beach, Israel and New York (where I have a number of speaking engagements). I'm not short on courage and never have been. I believe with all my heart that the Gospel has the capacity to change people’s lives. And to make them safe as well as civilized. That’s essentially how Western civilization began in Europe and America. It all began with a Gospel Witness. And that’s what I intend to do. And that’s because one has gone before me that is greater than me and given me an example to follow. His name is Jesus. What about you, my friend? Will you stand up for Him in the coming days of religious tension that isn’t just possible, but assured? If none go with me, still I will follow my Audience of One. But I hope you will join me. The God of Heaven loves you more than you could ever think, ask or imagine. And, my friends, I do as well. God Bless You.